If you have looked hard at a single object, you may have found that an image of the object lingers even after you’ve looked away. Such is my experience every morning, when I drink green tea from a small porcelain cup. Looking down, I see the cup’s white rim, which forms a perfect circle. Looking up, I see that same circle, now in black, projected against the bamboo rug. In its main features the image resembles the enso, or Zen circle–a symbol of enlightenment and absolute reality. Zen meditation is essentially a process of stopping and looking. Amidst the multiple distractions of everyday life, the images in our psyches may well escape notice, but when we sit still, follow our breathing, and have a look at our interior lives, those images often return with a vengeance, bearing their cargo of memories and associations. How, if at all, should we respond to them? What, if anything, should we do? Perhaps the most reflexive response is to pursue the image: to dwell in the past. Encountering the image of a barge, for example, I might recall the scenes of my childhood, when I sat for hours on the banks of the Mississippi River, watching the barges pass. Pushed by powerful “towboats,” those massive platforms transported steel, coal, and other freight north toward Lock and Dam 13. Viewed from a distance, the barges appeared to be moving slowly, as they rounded the bend and gradually disappeared. But in fact they were moving at a rapid, dangerous clip, and boaters were well advised to stay out of their way. Remembering their bulk and speed, I recall that one of my schoolmates, a third grader named Michael Stone, drowned one night beneath a barge. A few days earlier, I had wrestled with him on the playground. When someone thinks about the way his body was in the past, the way his feelings were in the past, the way his perceptions were in the past, the way his mental factors were in the past, the way his consciousness was in the past; when he thinks about these things and his mind is burdened by and attached to these things which belong to the past, then that person is pursuing the past. To think about the past without being enslaved by it is a formidable challenge, but there are ways of meeting that challenge. Jack Kornfield, a clinical psychologist and renowned Vipassana teacher, advises us to heal the wounds in our psyches by bringing meditative awareness—“that which knows”—to our painful memories. Similarly, Zen master Thich Nhat Hanh urges us to review the past and “observe it deeply” while “standing firmly in the present.” In that way our destructive memories can be transformed into something constructive. In either case, the method is first to ground ourselves in the present, and second, to cultivate a generous, clear awareness, in which images from the past, however troubling or enticing, arrive and last for a while but do not become objects of obsessive thought. Like barges observed from a river bank, they interest but do not overwhelm us. * Elizabeth Bishop, “Quai d’ Orleans,” The Complete Poems: 1927-1979 (Farrar, Straus and Giroux,1984), 28. **Thich Nhat Hanh, Our Appointment with Life: Discourse on Living Happily in the Present Moment (Parallax, 1990), 6. 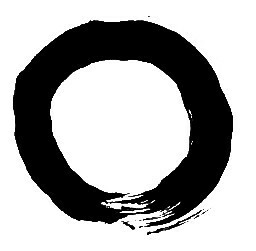 Enso (Zen circle) by Shinge Roko Sherry Chayat Roshi. I appreciate the clarity of this teaching. Sometimes I get a glimpse of how I use the past to reinforce my sense of continuity and persistence – the belief that I have have a self. This *usage* of past experience seems quite subtle, but I suspect that it’s always in play, shaping my present experience. Hard training.